All honors from this past week go to Dock Street, a Philly original still doing it and doing it well more than 25 years since first opening on 18th Street. Where has this California Common Lager been? Or maybe where have I been? This toasted malt lager starts strong and cleans up nicely, making it one heckuva easy drinker. Very well done, this one deserves to make a regular return to the draft list at Dock Street. 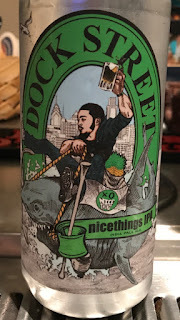 It wasn't until I was told that this was a collaboration beer that I recalled being introduced to the local rap star behind this beer, Chill Moody, by Dock Street's Marilyn Candeloro during Philly Beer Week. Thing about this IPA is that it is, indeed, very nice. Straight ahead IPA that 1) proves IPAs don't need to be (overly) hazy to be very good and 2) the Mosaic hop is a mighty tasty hop. Had it on tap with a Flammenkuche (because, well, you know) and then thanks to Certo for sending a can home with me for further inspection.